Any May a Beautiful Change. 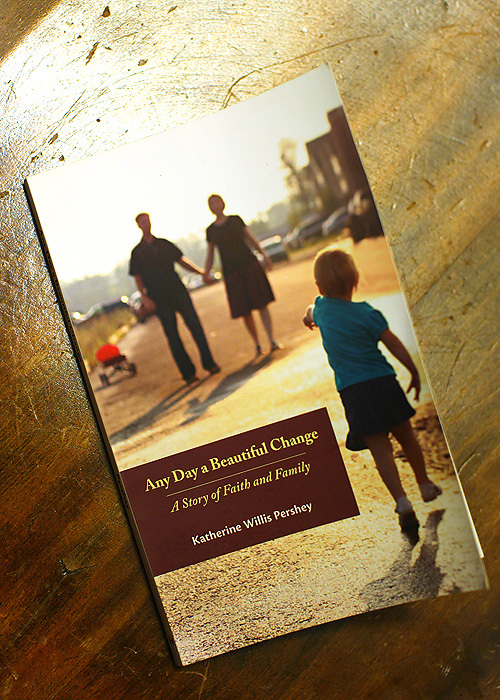 Last month I was honored to receive one of the first copies of Katherine Willis Pershey’s memoir Any Day a Beautiful Change. Katherine’s blog of the same name was one of the very first I started following six or so years ago and to be honest, I don’t even know how I found her. But the way she wrote about her young married life, her young pastoral life and, eventually, her young mothering life had me hooked. As one who toyed with the idea of ministry at a young age but always felt not good enough/brave enough/smart enough/called enough, it was and is fascinating to live vicariously through Katherine’s life. Over the years my relationship with Katherine has moved from stalkerish blog reader (me!) to friendship. We made an attempt at getting together in Chicago last month but work schedules and family obligations prevented that from happening. So while we still haven’t officially met in person, I agree whole heartedly with the inscription inside my copy of Any Day a Beautiful Change: For Erin, as dear and real a friend as ever there was. Right back at you Katherine. On the first of this month Katherine launched a blog carnival inviting friends and readers to put together their own post documenting a beautiful change in their lives. “Any May a Beautiful Change” was the name. Perfect, right? And true to my “if you wait ’till the last minute, it only takes a minute” philosophy, I’ve waited until (literally) the eleventh hour (it’s 11:10 p.m.) of May 31st. Not because I didn’t want to do it, but because I wanted to do it well. Right. Beautifully. There was a time in my life (not so long ago) when I was a planner to the nth degree. A five year plan wasn’t good enough and a ten year plan barely cut it. I was confident in the direction my life was heading – marriage, teaching career, babies, years at home, teaching career, kids, teaching career, teenagers, teaching career, early retirement. It sounded so very Rockwellian and that was so very fine by me. And then my life took a turn that I never, ever expected. I started a blog, picked up a camera, changed careers, discovered my creative spirit, moved to a new town, launched a business and the rest is living history. When I look back on the last ten years of my life I realize that only the first four even remotely resemble my life plan. The last six have been so outside my box. And so beautiful. And I’ve discovered the magic of never being quite sure what is hidden around the next corner. What used to scare the pants off of me – that awful things called not knowing – is now just an opportunity waiting to happen. Sure, there are still days when I fret just the teensiest bit that I don’t have a Plan B. (Or should I say Plan C, since I think technically I’m living Plan B?) I’ve let my teaching licenses expire and don’t ever see myself pursuing that path again. And sometimes I get a pit in my stomach when I think the big think: what next? But then I just remind myself of the place that I’m in right this very moment. The place that I never, ever, ever could have predicted. And I remember how very lovely this place is. And I find myself trusting that Plans D-Z will surely have their own aura of loveliness. There in that knowledge – that trust – do I find my peace. No longer do I trust in a 10 year plan. Rather, I trust in a God who is infinitely larger than the last – or the next – 10 years. And that, my friends, is a mighty beautiful change. I can’t say enough about Katherine’s book Any Day a Beautiful Change. Katherine’s writing is comfortable and approachable enough for a day at the beach or a stolen hour on the couch, yet intellectually hearty enough for a round table discussion. Not to mention that she’s spiritually challenging enough for those who need some meat to chew on, yet honest enough to allow space in her writing and theology for those who find themselves curiously seeking this thing called “grace”. I loved the glimpse into her unique world where mama-hood meets pastor-hood meets woman-hood. Now that’s a grace-filled trinity if there ever was one. 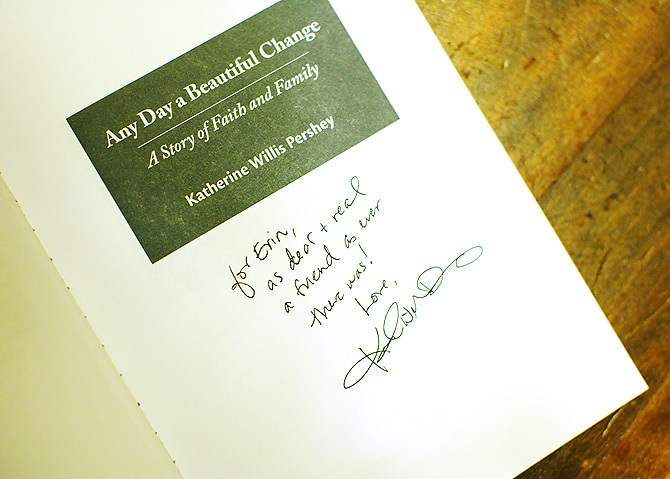 If you’d like to read Katherine’s abundantly lovely memoir (and really, you should!) pick up a copy on Amazon after trying your hand at winning one right now. Just drop a comment down there in that little white box and I’ll choose a winner in the next few days. Keeping my fingers crossed that you might even get a signed copy. Sounds like a great book, you have me intrigued. If I don’t happen to win, I definitely need to pick up a copy! There are several blogs I read that have mentioned this lovely book. Can’t wait to read it, so here’s hoping I can win a copy! I would love to read this book…thanks for the great suggestion for my vacation next week! Looks like an amazing book! My life has taken many different paths, now in my “mid-life” stage I’ve discovered my passion ( as I came upon Karen Russell’s blog ) photography! Would love to win a copy. Funny how things don’t work out as we plan, but they do work out exactly how it is planned! I would love to win the book! This sounds like a great book and I loved your story Erin. I would love to win! I’ve been looking forward to this book. I heard nothing but wonderful things about this book. Great post! So cool how your life took an amazingly different path than expected. The book sounds great and I would love the chance to win a copy! This books sounds like a perfect summer read! I love a good inspirational book. As a wife, mom and child of God I sometimes struggle with my plans verses His. In the end, I know His are mine, so I don’t know why I tend to be so bull headed! Thanks for sharing. This is a great reflection and makes you think about what matters in life. I always thought I’d go back to teaching once I stayed home for a few years with my children. While I certainly miss teaching, the longer I’m away from the classroom the more I think there may be something else that I’m called to do. That thought is both scary and exciting! Learning about your journey from teacher to mother to business owner is inspiring. I’m going to put this book on my reading list! I would love to read this book – and winning one would be even better! It sounds like a great read; I hope I win. I need a great book to read on the plane to Hawaii!!! Wow, Erin! “Rather, I trust in a God who is infinitely larger than the last – or the next – 10 years.” That is it – right there. THANK you! Oh, I love your post Erin – and the 5 and 10 year plan is so me. I’m feeling the same way lately, about finding my creative spirit in the midst of my overplanning life (did I mention I’m a meeting planner?) Would love to have a copy of what appears to be a beautifully inspiring read! Sounds like a great book but you might just want to think about following her lead and write your own book! I’d be the first in line to buy it along side your mom and Meghan (aka The Red Thread). This sounds like just what I need right now. Keeping my fingers crossed I win a copy! Thanks for the chance Erin! Sounds like a gret book! I could use something uplifting to read this summer! Would love, love a copy of her book! Thanks for the chance! what a beautiful story erin. and a beautiful book. i’m about to hop over to her blog now… she seems so inspirational. thanks a lot for sharing. and i hope to win! Would love to read Katherine’s book. A signed copy would be such a treasure. Have a great weekend, Erin. Very exciting to know an author! I would love to win the book. Can’t wait to check it out Erin! Thanks for the giveaway…here’s to hoping it’s me that wins. …..when can we look for your book on Amazon? This sounds like the perfect book to start my summer! I love your post too. 🙂 My life isn’t how I imagined either – and I find little tears of gratitude surfacing a lot more lately than I thought possible. What an amazing journey! Beautiful pictures and thoughts on your Beach Day post! oh what a lovely opportunity! the book sounds just wonderful and would love to win me a “signed” copy! 😉 a signed copy from you would be just s wonderful. What¦s Going down i’m new to this, I stumbled upon this I’ve found It positively helpful and it has helped me out loads. I hope to give a contribution & assist other customers like its helped me. Good job. Thank you for your whole hard work on this blog. My mother takes pleasure in engaging in investigations and it’s easy to see why. Most of us hear all about the dynamic tactic you produce helpful thoughts through the blog and foster participation from people on that theme while our girl is in fact understanding a lot. Take advantage of the rest of the year. You have been conducting a very good job.